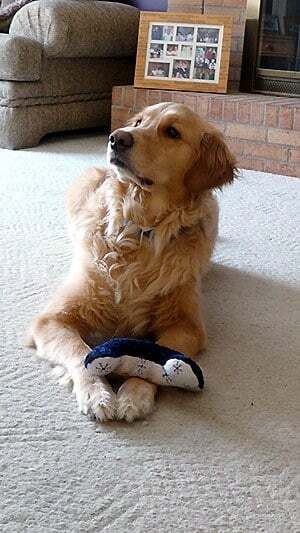 Happy 3rd Birthday to my Golden Retriever, Einstein! 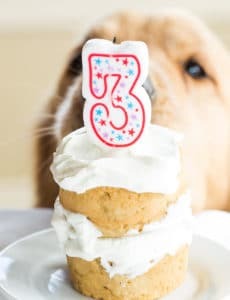 Since I find an excuse to bake for just about every other occasion I couldn’t let my dog’s birthday pass without letting him enjoy a special cake. 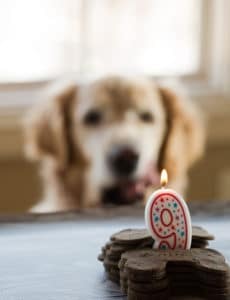 I went looking online to find a dog-suitable recipe for a cake and can you believe there are whole bakeries out there dedicated to dog treats and cakes? I was astonished! Probably a very nice niche to be in, actually. In the end, I used some of the same ingredients that went into the homemade dog treats I made a couple of years ago. Throw in some shredded carrots and a few other things, and the cake was ready to go! 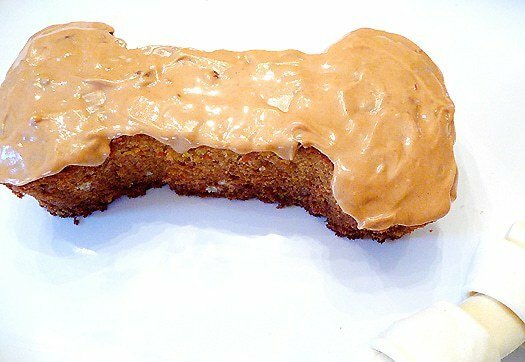 It can be baked in a round pan or a loaf pan; I did it in a loaf pan and then carved it into a bone and used peanut butter for a little “icing”. I also read that you could puree cottage cheese for white icing as well. He waited so patiently for me to give him his cake and then enjoyed the rawhide to top off his birthday evening. What a spoiled little man he is! 1. Preheat oven to 350 degrees F. Grease an 8" round cake pan or an 8x4-inch loaf pan. 2. Whisk together the flour and baking soda. Add the rest of the ingredients and, using a rubber spatula or wooden spoon, mix until thoroughly combined. Pour batter into pan and bake for about 30 minutes, or until a knife inserted in center comes out clean. Allow to cool, then spread additional peanut butter on top for "frosting", if desired. Made this again today for our Schnauzer’s 12th birthday. I made it at least twice before and she always loves it. Easy, too. Dogs aren’t supposed to have too much vegetable oil, right? I thought they should only have, like, 1 tablespoon in treats. Is 1/4 cup of vegetable oil safe for them? 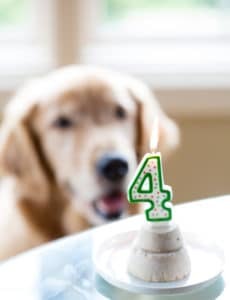 I have two doggoes that are super hyped up for their birthday, and I don’t want to get them sick. Do you think I could make a few cupcakes instead of one cake with this? If so how many cupcakes do you think it would make? I’ve just done this today, I made 10 out of the batter from the recipe, they aren’t huge but they suit my boys as they are only mini dachshunds. Have to say, I’ve eaten two myself! I made this last evening for my Great Danes 9th birthday. She and her two “sister” danes loved it. I’m going to try it again but using carob chips instead of the carrots, just to mix it up a bit. I even tried a little piece, and let me tell you, its good! Since I eat healthy, this works great for me too. 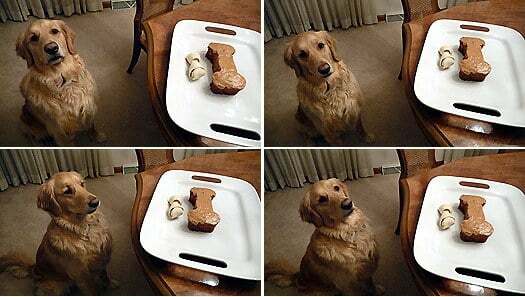 Where do you get the doggie bone shaped cake pan or do you just impervise an use a knife to cut your own doggie bone shape.. :) .. Thank you.. Nancy L.Sparks..
Is baking soda in the recipe good for dog? Hi Lin, If you are concerned I would recommend checking with your vet. My son and fiance have a St Bernard and we made her this cake recipe, it was such a hit with all the dogs that were invited to share. We tried a tiny piece so moist and the honey gave it a sweet taste. Recipe is a keeper thanks! I never baked this cake but after seeing its positive reviews, I will surely bake this cake in this weekend. Yours has icing but I don’t see the recipe for that. Can you tell me what you used please? Hi Jo, It is just straight peanut butter; so sorry, I mentioned it in the written post, but not in the recipe. I will fix that. So glad your pup enjoyed it, Jo! Thanks for the note on the peanut butter; I’ve actually never seen peanut butter with xylitol as an ingredient! Just curious if anyone has tried adding pumpkin to the cake mix instead of carrots or honey? ?